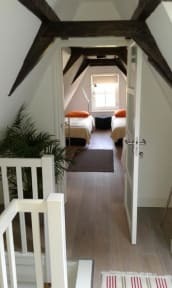 Residence 86 i Amsterdam, Holland: Reservér nu! 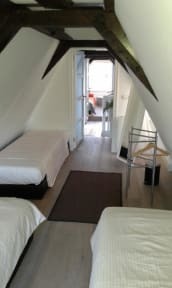 Residence 86 Amsterdam offers homely rooms with the state of the art basic interior in the heart of Amsterdam Canal District close to all the attractions. A charming recently renovated centrally located boutique styled guesthouse. We give you assistance in making reservation for any of your explicit desires or offer you advice on restaurant and/or places of interest. Each room features the following: free hairdryer on request, tea/coffee making facility and free WiFi in all rooms. No traditional 24 hours front desk. All arrivals will need to provide arrival time. There is no elevator or concierge in this building. The guest suites are located two floors up. The rooms have shared bathroom facilities. Guest must inform us of their expected arrival time (either via special space on reservation form or via email). Check in after 20.00 - extra charges. Taxes not included - city tax 7.00% will be added. Breakfast not included, but semi-equipped kitchen available for use, plus complimentary coffee/tea. No 24hours reception desk, that's why it is important that you inform us about your arrival time. Guest must provide a correct telephone, preferably mobile number, where they can be reached. There is no elevator or concierge in this building. The guest suites are located two floors up. Shared bathroom.